The US Marshals Service 225th anniversary is in 2014. A bill introduced in the House of Representatives would celebrate the occasion with commemorative silver and high relief gold coins. President George Washington appointed the first 13 U.S. Marshals on Sept. 24, 1789, which was two days after he signed the Judiciary Act of 1789 into law. 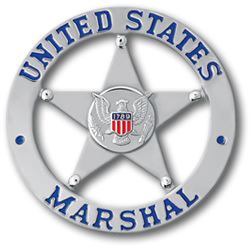 Since then, US Marshals have served the Nation in varying capacities with distinction and honor (see US Marshals service history). Rep. John Boozman introduced H.R. 2799, or the United States Marshals Service 225th Anniversary Commemorative Coin Act, on Wednesday, June 10. The bill calls for the US Mint to issue up to 500,000 silver dollars and a maximum of 100,000 gold coins struck in high relief. Both would be minted in collector proof and uncirculated conditions. The language in the bill reveals that the coin designs should be "emblematic of the 225 years of exemplary and unparalleled achievements of the United States Marshals Service." Further, it dictates that the obverse ("heads" side) of both silver and gold coins must bear the image of the Marshals Service Star, also known as "America’s Star." The gold coin reverse design would depict the sacrifice and service of the men and women of the US Marshals Service who lost their lives in the line of duty. Each coin would have edge-incused inscriptions of "Justice, Integrity, Service" — the US Marshals Service motto. As is standard with commemoratives, the $5 gold and $1 silver coins would carry a respective $35 and $10 surcharge. The first $5 million collected would go to the United States Marshals Service National Museum for preservation and maintenance purposes. Further amounts would be divided between various funds, services and charitable organizations. Bronze duplicates of the gold coin would also be authorized. For a coin bill to become law, it must pass both in the House and Senate, and get signed by the President.